When Bob Dylan embarked on his “Rolling Thunder Revue” in 1975, it was part of his creative renaissance. It was his second wind after a hum-drum few years at the dawn of the 1970s. The revue traveled by train and included a laundry list of friends and collaborators, new and old. Before The Bootleg Series Vol. 5, Hard Rain had already been released documenting the tour. But Hard Rain was tired and disappointing. Here, Dylan sounds desperate, in the sense of being urged to go on. This one opens with a blazing “Tonight I’ll Be Staying Here With You” (a song debuted on Nashville Skyline). It then drifts into a few rather dated reworkings of old songs. Dylan’s backing band may feature a lot of big names, but they play a kind of music that often suffers from the worst excesses of the era: ornate guitar wankery, hollow, tinny and effect-laden engineering, and a full and claustrophobic sound that lacks space. They are basically just self-indulgent hippie jams. But the end of disc one turns to folk. This highlights much of what was missing on Hard Rain and much of what came next in Dylan’s career. He started as a folkie, and he was a good one! He then went electric, which was what launched him to superstardom. His contentious concerts of that era would feature some acoustic folk and also electric rock. His albums of that era mostly did this too. Later though, particularly from the late 1970s onward, everything was more or less electric. He was far less successful in a purely rock setting. For whatever reason, there was only so much rock music that Dylan could put out at one time. It could be — let’s not forget — that when Dylan went electric it was before the modern rock era. It was only about a decade out from Elvis and other early rock that was not strictly urban. As that kind of stuff was left behind, Dylan didn’t adapt particularly well. Maybe folk seemed equally of the past at times (he did return to it though). 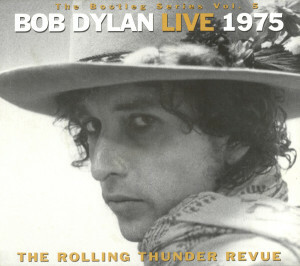 But a set like The Bootleg Series Vol. 5 includes the right amount of folk. It’s some of the most consistent material here. For instance, there’s a great “Tangled Up in Blue” here (maybe better than the studio version). The set wraps with more electric material at the end of disc two. The last few electric songs work better on average than much of disc one, settling into a sound comparable to contemporary Grateful Dead. The second disc also features a lot of songs from the not-yet-released Desire, and the whole band seems engaged with the new material. There is something hard in this music. It looks back more than forward. It is like a reaction to the 1960s. Not everything had gone as planned. Dylan couldn’t have anticipated his celebrity status. He probably wouldn’t have expected his career to start slipping in the 70s. What makes this interesting in how it tries to avoid defeat. But in doing that you can sense that much more than before the possibility of defeat looms larger in Dylan’s consciousness. This was it though. Desire, released a few months later, would be the last truly relevant Dylan album.